Story: Bernard Barros and his two sons Alex and Marc were searching for the underwater city Neuport. When they found the city, the ship was sunk by Worlok. By magical means, they were saved by Roman, giving them the ability to breathe under water. Alex and Marc were given additional powers. Bernard stayed behind to help Roman against Worlok, while Alex and Marc was send to the surface. Bernard was declared dead and Alex and Marc enherited a fortune . With the money, they founded the second Brigade, started by Battlestone . 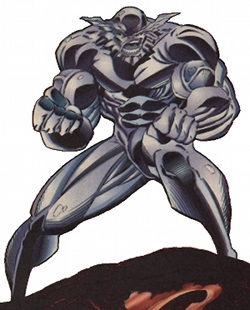 During a fight with Bloodstrike, Shogun hit Coldsnap with an energy blast ruining the regulation apparatus he was wearing. His powers running amok, Alex was covered in ice. Calling in a favour at GATE International, Battlestone saved Coldsnap . The process changed Coldsnap into an ice monster . The change made Coldsnap more and more bitter and withdrawn, as his apprarance kept mutating and couldn't do anyting about it. When Crypt attacked Brigade, he died trying to get revenge for Crypt killing Thermal, the woman he loved . Note: An out-of-continuity story show Coldsnap and Thermal to be alive . 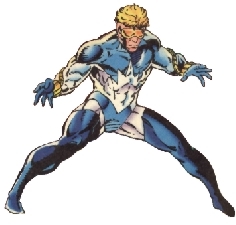 Skills & abilities: Coldsnap can project varying levels of coldness from his body. Equipment: Before being turned into ice, Coldsnap wore wristband to channel his power.